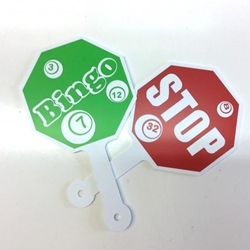 This sign is great for helping you call Bingo and doubles as a fan in those hot halls. It is a large paddle that says "Bingo at last" on both sides. It measures, just over 6" wide and 10" long. It is light weight.